Somebody better tell Goldman Sachs. There were a handful of high-points amongst the US recorded music revenue figures in the first half of this year – but they were all overshadowed by softer growth in streaming and, particularly, an unprecedented decline in CD sales. 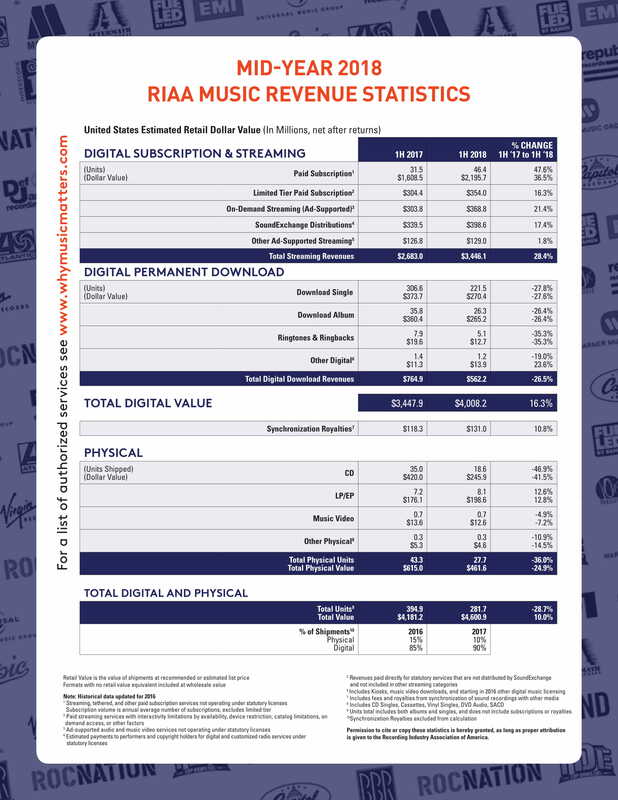 Overall revenues in the market, across digital and physical formats, were up 10.0% to $4.6bn according to the RIAA. That represented a year-on-year climb, in monetary terms, of $419m from H1 2017 to H1 2017. This jump, however, was smaller than that witnessed when comparing H1 2016 to H1 2017. The numbers in these two years have been restated by the RIAA, with H1 2016 at $3.5bn and H1 2017 at $4.2bn – representing year-on-year growth of $700m. In other words, the recorded music growth seen in H1 2018 was approximately $280m smaller than that seen the year before. And in other, other words… annual growth in the US recorded music market currently looks likely to be around half a billion dollars smaller in FY 2018 than it was in FY 2017. One reason for this slowdown is because of the (arguably predictable) softer year-on-year growth of streaming. 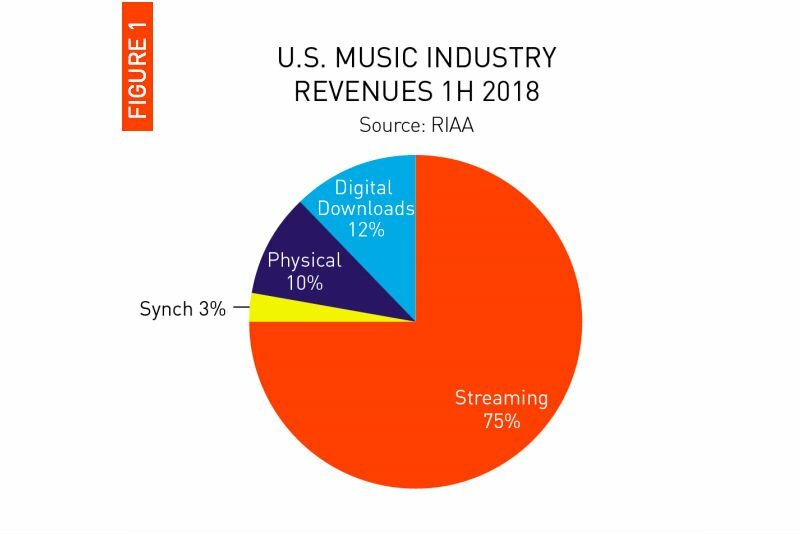 Total US streaming revenues in H1 2018 were up by a healthy $700m (+28%) to $3.4bn, according to the RIAA. Yet in the year-before equivalent period, these figures jumped by a full billion dollars, up from $1.7bn (H1 2016) to $2.7bn (H1 2017). Within the topline H1 2018 streaming number ($3.4bn), paid subscriptions (including ‘limited tier’ subs) grew 33.3% to $2.55bn, up from $1.91bn in H1 2017. Ad-supported, on-demand streaming revenues grew by 15.6% to $498 million. Perhaps the most discussion-worthy figure in H1 2018’s numbers, though, was a dramatic decline in CD sales. In H1 2017, the US recorded music business saw $420m-worth of retail CD sales. In H1 2018, this number slid to just $246m – down by a whopping 41.5%, or $174m. Here’s why that’s particularly galling for those whose businesses rely on physical music: according to the RIAA’s 2016 and 2017 figures (which have since been slightly adjusted), revenues taken by CDs at retail fell by just 2.9%. One year: a 2.9% fall in CD revenues. The next year: a 42% fall in CD revenues. As for unit sales? Lovers of the compact disc, cover thine eyes. In H1 2018, CD album unit sales in the United States were pretty much slashed in half – down from 35m to 18.6m. Ouch. Because of these changing dynamics, streaming was responsible for no less than 75% of the total $4.6bn turnover of the US recorded music business in the six months from Jan-June this year. Digital downloads, with $562.2m, claimed 12%. That was comfortably (by $100m) bigger than all physical music revenues combined (CD plus vinyl etc. ), which stood at $461.6m – representing just 10% of the overall pie. 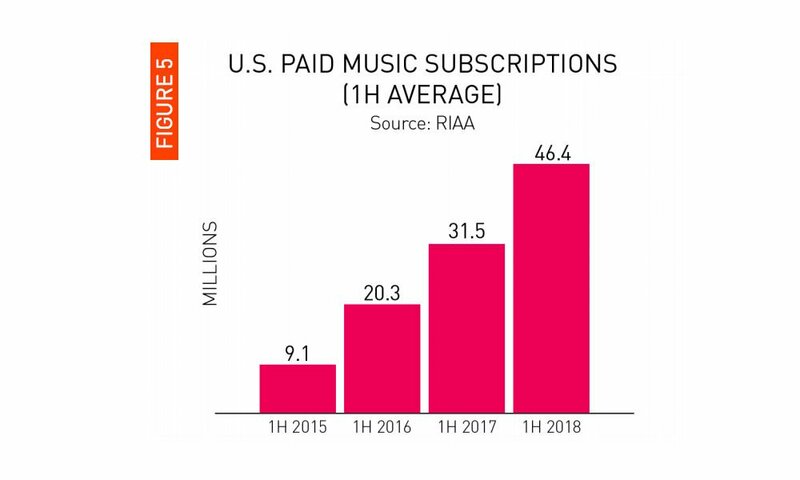 In more positive news for the industry, average paid-for US streaming music subscriptions climbed by 14.9m in H1 2018 – more than 1m per month. That was a bigger leap than that seen in any prior year. Mitch Glazier, President of the RIAA, highlighted Gold and/or Platinum albums from the likes of Camila Cabello, Drake, Cardi B (pictured), Post Malone, Migos, Charlie Puth, Travis Scott and Jason Aldean as standouts from the half-year period. Check out the full RIAA H1 2018 report through here, and the headline numbers that matter below.